From inside a business, it is difficult to look objectively at elements. You might be blind to the pitfalls that your customers and potential clients see; for example, you might think that your company logo looks absolutely perfect and fits the bill for the product and services you are trying to sell but your potential clients might disagree. The same goes for customer service. It’s hard to know if a customer is going to return if you are not sure of the kind of service they have received. A high percentage of customers will not come back to a business if they have received rude or even adequate customer service, particularly in the cases of restaurants and hotels. However, there is one way to receive instant feedback from your customers to give you the opportunity to improve; surveys. 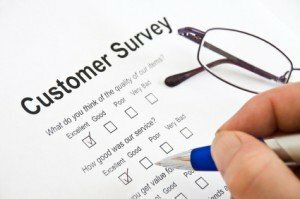 The idea of surveys may seem too simple or even old hat, but there really is no better way to understand how your customers rate the company than to survey them. Simple questions can make a big difference to your company and the way it operates. One to five questions are usually good, but a text box at the bottom with further comments is even better as some people (especially us, the British public), will tend to tick 4/5 or 3/5 if they were not satisfied, but felt the service was ok. The box area leaves room for some honest opinions and, more often than not, these are the areas your business can work on to improve. Once you have a set of customer service reports/completed surveys, the best thing to do next would be to send them off to a survey scanning company such as us here at Pearl Scan. We take the surveys, scan them into our systems and use our custom built software to analyse where the boxes have been ticked which will then put the results into an easy to understand documents for you. We can even send the information in a presentation with graphs and charts if you prefer. Digitising your surveys will save lots of time scouring through them, manually writing data down or adding it into a Word document. For handwritten text, data entry may also be required, however; this can be done quickly thanks to our advanced systems and the costs remain relatively low. Here at Pearl Scan, we offer a bespoke service which you can tailor to your needs. Our data capture service will improve efficiency with ease of access to required data and let you spend more time making improvements to the company in line with that data. But surveys are not just about finding the problems, they are also about finding out about what your strengths are and even how you can build on them and become the best at what you do. If you would like to take steps to become the best at what you do or would like some more information on our data capture services, get in touch today to speak to a member of our friendly and experienced team.